Anna Gilthorpe recently returned to the UK after volunteering for three weeks at the kindergartens’ of the Regional Model School and St Cecilia’s, assisting the teachers with their work. 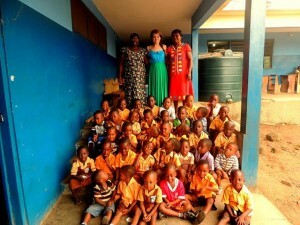 Below are her thoughts on her time volunteering with KickStart Ghana. Q. Why did you choose to volunteer with KickStart Ghana? I chose to volunteer with KickStart Ghana as I have seen fantastic things about their work from following them on Facebook and heard from previous volunteers about what an amazing and rewarding time they had working for them. Another blog from Chris Minch, our 2013 Assistant Volunteer Coordinator. From my limited time spent in Ghanaian classrooms up until now, a few things have struck me as me very interesting. It is worth noting before I begin though, that I am by no means an expert on education and I have only actually spent time in three Ghanaian schools so my experience of education here is quite narrow. One thing which becomes immediately obvious is how passionate Ghanaians’ are about education. It forms a huge chunk of the government’s budget (about 25%) as primary and junior secondary education are provided free of charge and are compulsory. Teachers and children are aware of, and quick to emphasise, the importance of education in both societal and personal development. As a result, they take school very seriously. This commitment to education is refreshing in comparison to home where the majority of students appear to not want to be there and governments are cutting back education budgets year on year at the moment. Apologies for the delay in the latest blog post, but since I last wrote seven new volunteers have arrived and five of those have left. They’ve been completing a large variety of work. Chris Minch has settled in well to the role of Assistant Volunteer Coordinator. His time has been taken up by airport pickups, inducting volunteers, helping at the summer school and football training and also researching other NGOs in Ho. He is also blogging for KickStart Ghana this summer. Anna Gilthorpe and Rianna Kelly were working at two local Kindergartens assisting the teachers with their work there. Rianna has now taken the lead at the summer school and reading club; planning and executing the lessons with the assistance of Chris Coco and myself. Chris and George Wadsworth coached Dynamo FC and you can read about what they thought of their time in Ho in their blog post. Last, but not least, we had Jeffrey Smith and Adenike Oke from JointSight productions who are working with KickStart Ghana to create a series of videos that showcase our work. I can’t wait to see the finished films!